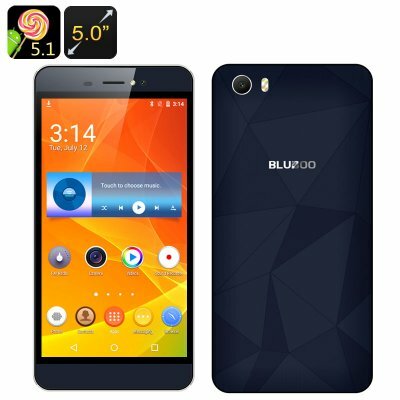 Successfully Added BLUBOO Picasso Smartphone - 5 Inch HD Screen, Android 5.1, 64bit MTK6580 Quad Core CPU, Dual SIM, Gesture Sensing (Black) to your Shopping Cart. Don't the let the name fool you. There is nothing abstract about the BLUBOO Picasso Android smartphone. It’s a powerful device, full of great features, including 3G connectivity, Android 5.1 interface, a nice 5 inch 1280x720 screen, two SIM cards and much more. The BLUBOO Picasso smartphone comes with a 5 inch screen with 1280x720 resolution that will display your media content in great quality. You will have access to the Play Store for lots of fun apps and games and the Android 5.1 operating system makes for a great interactive interface. Gesture Sensing brings with it a nice little shortcut. From now on, you will be able to get to some of the popular apps (Camera, Web Browser, Messages and others) simply by drawing the corresponding letter on the locked screen. The smartphone’s 64bit quad core processor makes operation smooth and fast, enables multitasking and together with Mali-T720 GPU makes for excellent gameplay. The BLUBOO Picasso Android phone comes with 3G connectivity on two SIM cards — a great option for when you prefer to separate your work and social life. The built-in LED flashlight will make sure you don't get lost in the dark and the 2500mAh battery guarantees 4 hours of non-stop talk time. The BLUBOO Picasso Smartphone comes with a 12 months warranty, brought to you by the leader in electronic devices as well as wholesale Android Phones..